We modern technophiles tend to think that all of the cool technology we have today is somehow new. It usually turns out that even the most 21st century of our gadgets have their roots in a long-gone past. Such is the case with cellular phones. Most of us know that they were around long before their commercial debut in the 1970s and 1980s, but did you know that their history extends all the way back to the 20s? 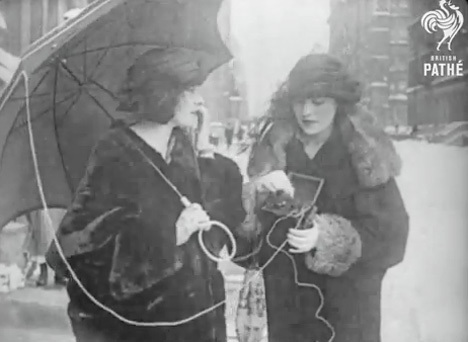 This excellent little silent video clip shows two flapper-type girls talking on a mobile phone back in 1922. The video shows that mobile telephones and sharing music on the go are anything but modern ideas. The two young ladies shown with the mobile phone stop to call their friend who puts on a record to play some music for them as they chat. At least our current mobile devices don’t have to be grounded to a fire hydrant or connected to an umbrella antenna in order to work. We love how simple the device looks despite being based on cutting-edge technology that wouldn’t actually be usable for another half century. See more in Vintage Videos or under Vintage & Retro. November, 2011.